Located within the Palmilla Resort, this new resort within a resort will have the first four homes available in January 2008. Members will be able to start making their initial reservations later this year. 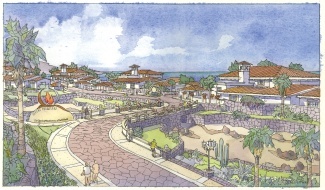 Quintess already has several homes at the tip of the Baja Peninsula in the Los Cabos area. In its recent club wide survey of members, more than half of all members ranked Los Cabos as their number one most important current destination. The new enclave, called Cielos Palmillas, will offer single-level four-bedroom residences with two wings, each of which has a master suite. Every home will also have a large terrace with a pool, built in spa and views of the Jack Nicklaus designed golf course and Sea of Cortez. Members will also have access to the Club Ninety Six private beach club and the One&Only Palmilla Hotel with its spa and restaurants. The Palmilla Hotel is a member of The Leading Hotels of the World, which is a key partner of Quintess and combined its Leading Residences of the World club with Quintess at the end of last year. At the time of this merger the club announced that it would be developing club homes at Leading Hotels properties. The Cielos Palmillas is the first of what will be several Quintess "enclaves" in resorts worldwide. Up until now, Exclusive Resorts has been the only destination club to have its own resorts, or resort within a resort, and so has 15 or more homes in many of its destinations. For the destination clubs, the economics of operating multiple homes in one location can be much more favorable, especially if the club also builds and develops its own homes. The clubs can also provide a greater level of services by having multiple homes and members in one location. As a (potential) destination club member one factor to consider is whether you are looking for this mini resort experience or whether you want a more individual home to use - this is very much a personal choice with pros and cons on either side. For other factors to consider in deciding about destination clubs download our destination club guide.